KU PGCET MSc Chemistry Entrance test Free Coaching in Kakatiya Govt Degree College, KUCET MSc Chemistry Entrance test Free Coaching in KDC, Free Coaching to MSc Chemistry Entrance Exam in Kakatiya Govt Degree College, MSc Chemistry Free Coaching, 45 days KUCET Free Coaching Programme, KU PGCET Free Coaching on Chemistry Subject. KUPGCET 2017 to be released at http://www.kudoa.in/Default1.aspx?cet=KUPGCET. So, KDC Principal Dr. V . Vijaya Laxmi and Course Director Dr. K. Somi reddy have announced the 45 days Free Coaching Programme notification on April 10 and they are inviting the interested candidates to give Free coaching to MSc Entrance Exam for 45 days in Kakatiya Degree College. The Free Coaching Programme classes to be held regularly in every day from 9 AM to 2 PM. The Daily Free Coaching Lessons to be given by Skilled and Experience Chemistry Lecturers. This programme to be conducted under the Department of Chemistry. 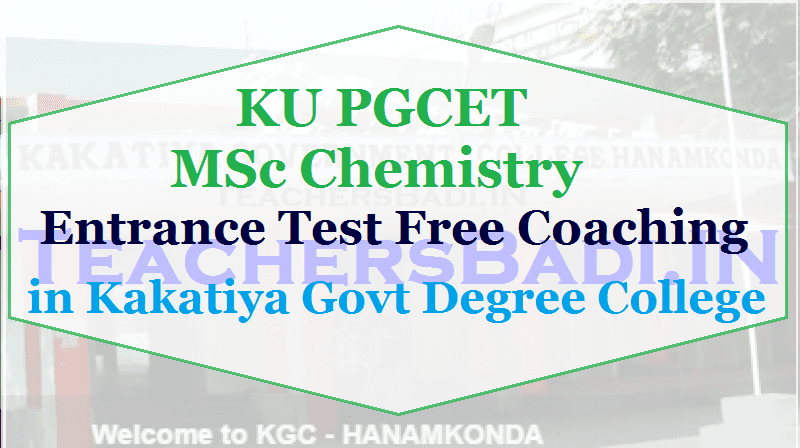 The Candidates, who want to get the Free Coaching Classes, they can register their names at KDC Chemistry Department. For more details candidates may contact the KDC Chemistry Lecturer Dr. Vasam Srinivas in personal or over the phone.